Online is the place for me to locate and purchase rare books. Several years ago, my wife and I were in a Texas town north of Dallas, and at the suggestion of a friend we made a visit to a used book store that reputedly dealt in rare books. When we arrived, I found the store to be somewhat skeptical of its customer base. Books that are currently in print were in great numbers, and easily accessible. However, when I looked at the prices I knew they would stay on the shelf if they were waiting for me to purchase them. That suggested that when I got to the rare books they would be overpriced, too. They were, but that is not what surprised me the most. Gradually as the books were grouped and displayed according to the extent of their rarity, they were harder to get to. Finally, when I came to the place where they had the rarest of their books, they were locked up tighter than Fort Knox. If that wasn’t bad enough, this area was on the second story, and every employee of the store was downstairs, and not very helpful when one of them could be rounded up. No one ever volunteered to help or ask if we were looking for anything in particular. After several minutes of walking around unnoticed, we just headed for the door and left. Since that day, when I am looking for or purchasing a rare book, I have gone back to my faithful source, the Internet! Obviously, not every book store is going to have the book you are looking for. In fact, you may have to go back again and again to find the book you need. A couple of months ago, I found a book on the Internet that I was told almost twenty years ago was impossible to find. Difficult, yes, but impossible, no, thanks to the Internet it wasn’t. But here is somewhere else to look, and you and I both knew this was coming; rare books on Amazon.com. You can click on the previous link, or go straight to Amazon.com. Type ‘rare book’ in Amazon’s search box, and narrow the search by choosing a field from the menu on the left hand side of the page. 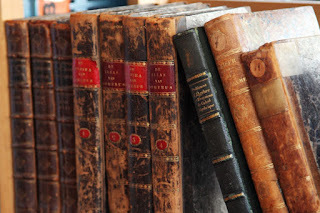 Now, choose from the “sort by” box at the right hand side of the page, whether you want books listed from the highest to lowest or lowest to highest prices, and you will find a ton of rare books. Of course, you can search for a particular book by author or title. Amazon makes it easy. Hope you find the book you are looking for.